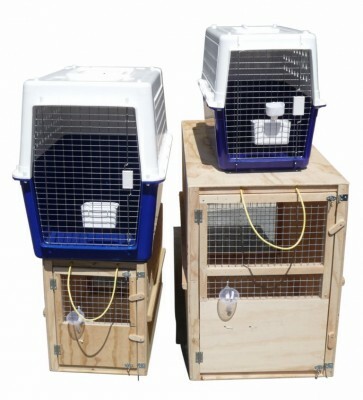 Pet transport cages for rent come in all sizes to suit your pet. Searching for a comfortable travel transporter for your pet can be tricky with cost and size varying substantially. At Aero Pets we are able to source a top of the range pet transporter on your behalf. If you do not wish to use the pet carrier beyond a single trip, then a temporary rental carrier can be sourced for travel within New Zealand only. Aero Pets only provide I.A.T.A. regulation approved cages which have to allow your treasured pet to travel in safety and comfort with access to water and room for manoeuvre inside their temporary home. Custom built cages or store bought cages may not conform to regulations so it is necessary to get a pet transport cage which does. The regulations ensure that your pet has the freedom to stretch and move around adequately as confinement can cause undue stress and anxiety for animals. It is also important that adequate ventilation and space is given to the animal in transit so that they are able to stand, move around and lie in a natural position. This is vital as animals may experience increased stress levels during flights due to air pressure and can become agitated or aggressive. At Aero Pets we pride ourselves on offering an exceptional service with professional and patient advice available to pet owners giving them piece of mind that their cherished family pet is looked after and arrives home safely and healthily. If you need any advise about a cage that you already own, we will be happy to speak with you about whether it is suitable for your pets travel needs.